I rode in sweltering weather. It seemed as though every day were over 95°F, so I spent the middle of every afternoon holed up in a restaurant with pie á la mode. It is dangerous to ride a motorcycle in air so close to blood-warm because your body can't shed excess heat. You may -- and probably do -- gain more heat from the sun and the hot wind than you can sweat away under high humidity, and low humidity is even more dangerous because you don't notice how warm and dehydrated you've become until you are past the limits of rational judgment. Thus, the weather is yet another of my excuses for curtailing my sight-seeing. Here then is my photo album, such as it is. I'm not able to conjure any coherent narrative from these pictures, so I suppose that I can show them in any order. I arbitrarily choose the historical sequence in which the subjects of the photos came into existence. The Sangre de Cristo Mountains formed within the last 66 million years (Bauer). They are the the eastern-most range in the Rocky Mountains. 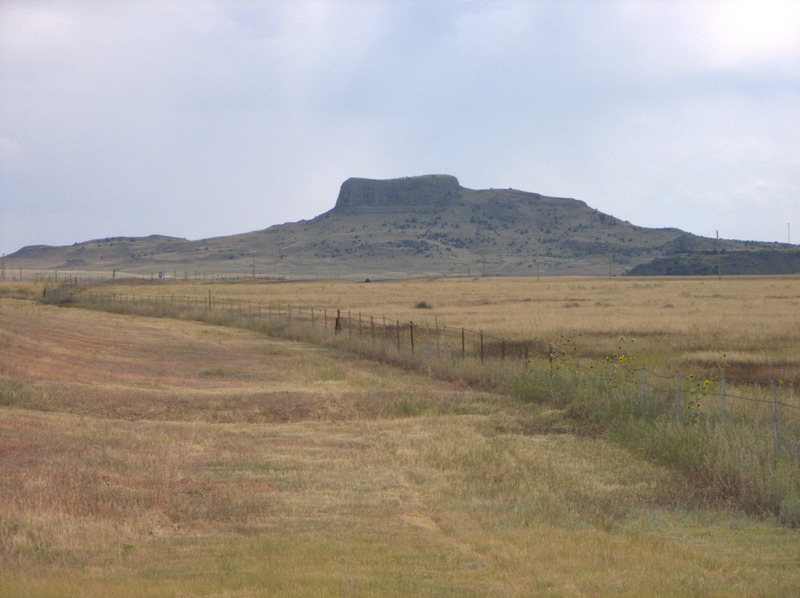 They were both a destination and an obstacle to Santa Fe Trail travelers from the United States because Santa Fe is on the other side. From this viewpoint they are about fifty miles away. 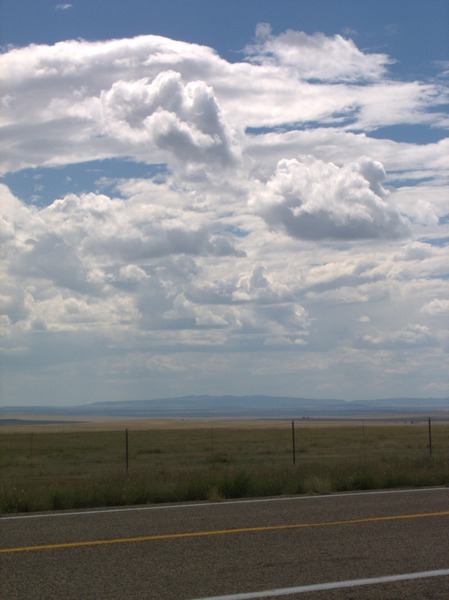 As a traveler in the flat and open terrain of the High Plains and in the ghostly company of those who've gone before, I, too, can see the attraction of various prominent geological features that capture the eye and compel contemplation. I suppose the heat, the long summer hours, and the vast distance all contribute to the effect. 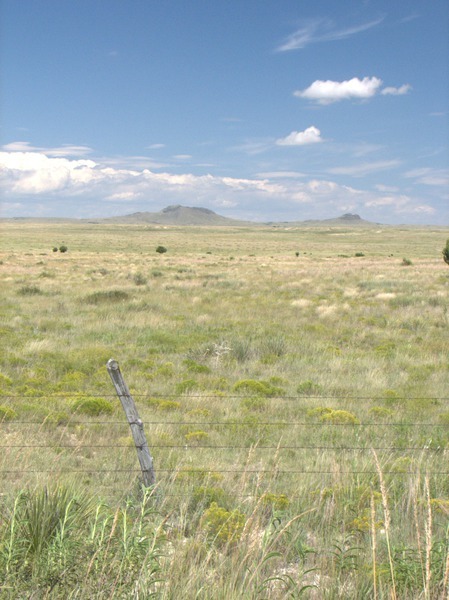 "The Raton-Clayton Volcanic Field covers nearly 7500 square miles of northeastern New Mexico and adjoining Colorado and Oklahoma. The distinctive characteristic[s] of the Raton-Clayton field [are] its great size, young age, continental interior setting, and possible association with one of the few volcanic hot spots in the world. If you start traveling east, you would not encounter volcanic rocks this young again until the mid-Atlantic ridge." These cinder cones are about three million years old (Seagle). Here is the only picture I took in Santa Fe. This is the Palace of the Governors, the seat of administration in Old Spanish Nuevo México from the earliest days. 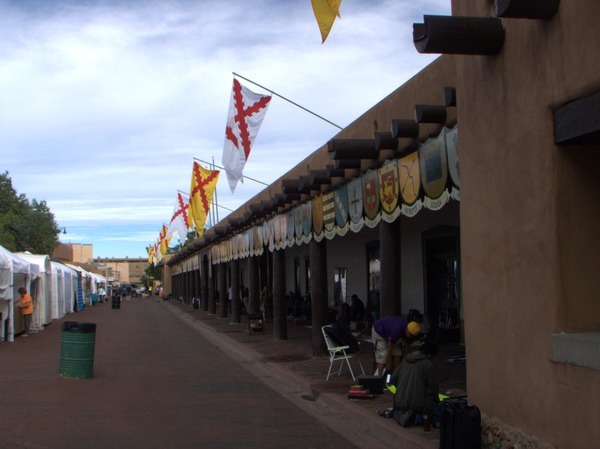 El centro of Santa Fe is surrounded by a kasbah, a maze of narrow winding streets. Apparently the Spanish Governors feared invasion and planned the streets so that a frontal attack was difficult (U.S. National Park Service, Palace of the Governors). This was so successful that even modern tourists are repulsed. Do not venture here without charging your cell phone and enabling GPS. On the day I visited, the square was chock full of vendors' tents. An art fair was in progress, and I could not see from one side to the other. Buildings at the Missouri end of the Santa Fe trail are not nearly so old. Here is an original road house that still stands in the historic district of the village of Arrow Rock on the Missouri River in the Boonslick area. 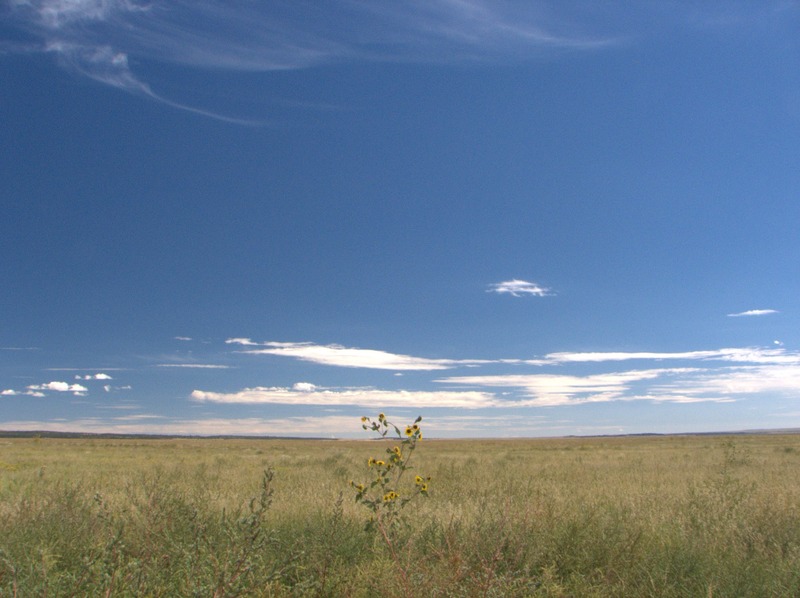 Construction of the third Fort Union in New Mexico Territory began in 1863. It was erected adjacent to the fortifications of the second one at the western junction of the Mountain and Dry Routes of the Santa Fe Trail. It would be the main logistical supply base for the U.S. Army on the High Plains for the remainder of the Civil War. It remained in use afterward to support the Indian Wars and to police the Santa Fe Trail until the coming of the railroad. The Mahaffie Farmstead at present-day Olathe, KS, was built near the end of the Civil War. 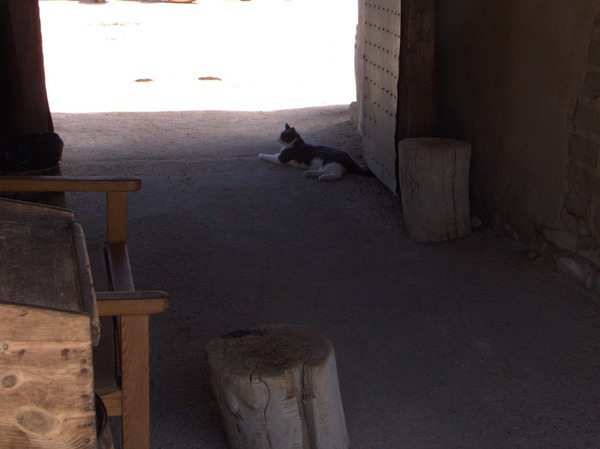 It served as a stage coach station on the Santa Fe Trail. 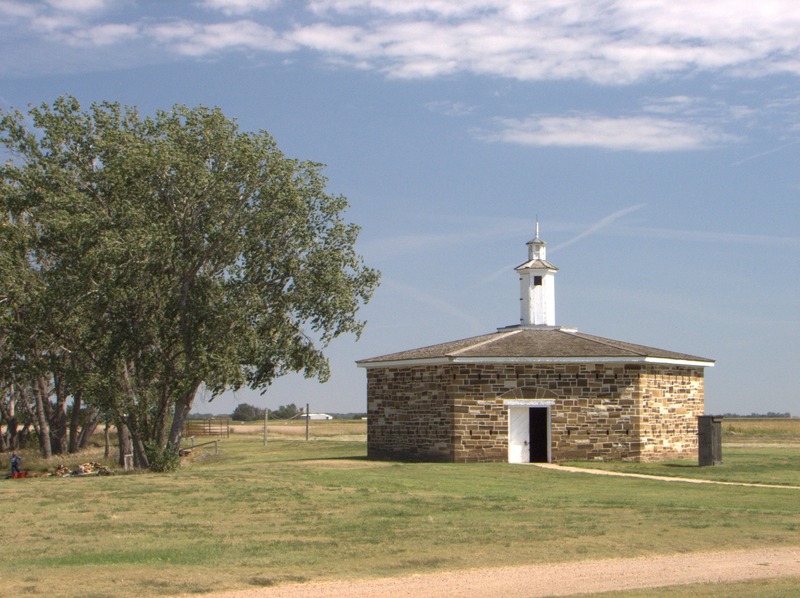 The stone buildings that remain at Fort Larned, Kansas, on the Pawnee River (aka the Pawnee Fork of the Arkansas River) near the eastern junction of the Mountain and Dry Routes of the Santa Fe Trail were constructed beginning in 1866. 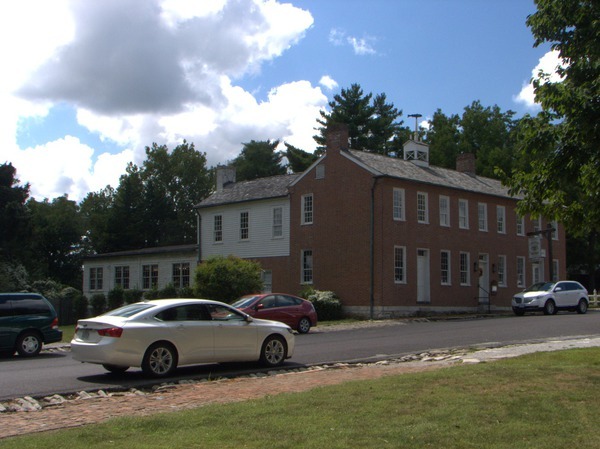 After renovation, this historic site is considered the best preserved of all frontier army installations. This is el centro of Las Vegas, NM, which is the namesake of the much larger and currently better known city in Nevada. 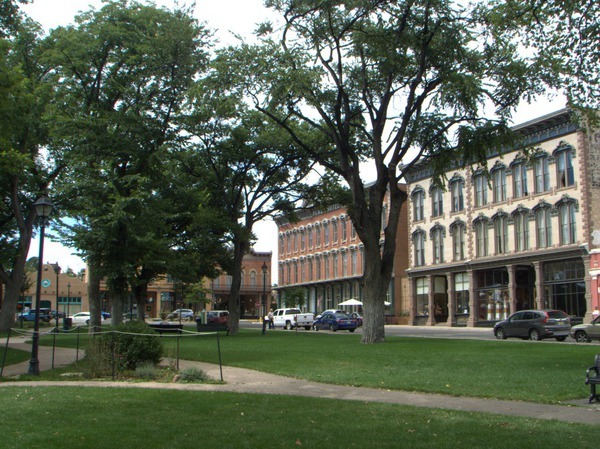 The restored buildings here are remnants of the Gilded Age. Las Vegas prospered as a stop on the Santa Fe Trail, and it boomed when the Atchison, Topeka, and Santa Fe Railway arrived on the opposite bank of the Gallinas River in 1880 (Wikipedia, Las Vegas, New Mexico). 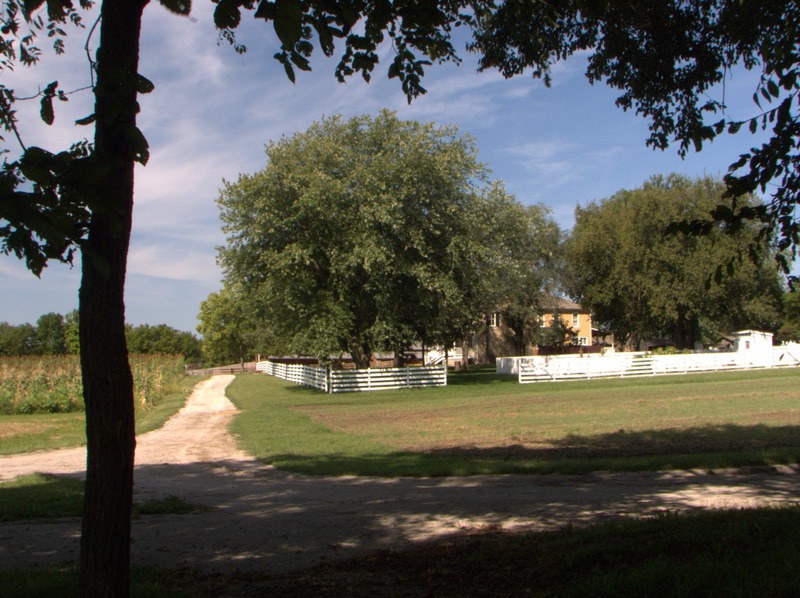 The Santa Fe Trail Center near Larned, KS, is a regional museum dedicated to preserving and interpreting the history of the Santa Fe Trail. It opened its doors in 1974. It houses collections of artifacts and antiques, which are exhibited in dioramas. 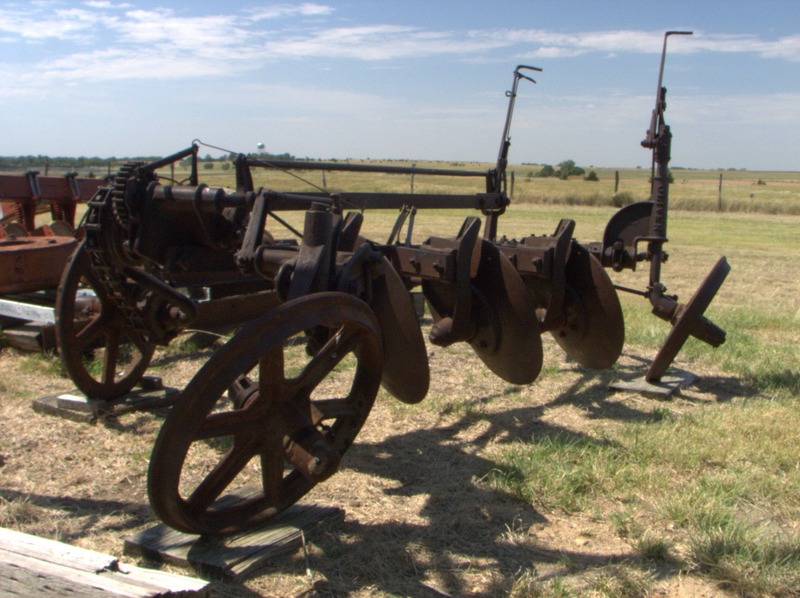 There is an assembly of obsolete farm machinery under roof and outdoors. Old buildings have been moved to the site for display after they could no longer be conserved in their original context. Bent's Old Fort on the Arkansas River near present-day La Junta, CO, was rebuilt in 1976 from measurements taken in 1846. Today the U.S. National Park Service operates it as a living history museum. Please be aware: "The park’s livestock have free range over three hundred acres of grassland north of the Arkansas River (U.S. National Park Service, Bent's Old Fort Livestock)." It sounds like a lot, but it's only the land immediately adjacent to the fort. Livestock include legacy breeds of horses and cattle (oxen), some mules, peacocks, and a cat or two. Livestock are fairly tame and accustomed to tourists; nevertheless, the larger animals can inflict serious injury -- particularly when provoked but even inadvertently, too. This is not a petting zoo; there are no fences. It is best to keep your distance from the animals. Rhode, Charles. 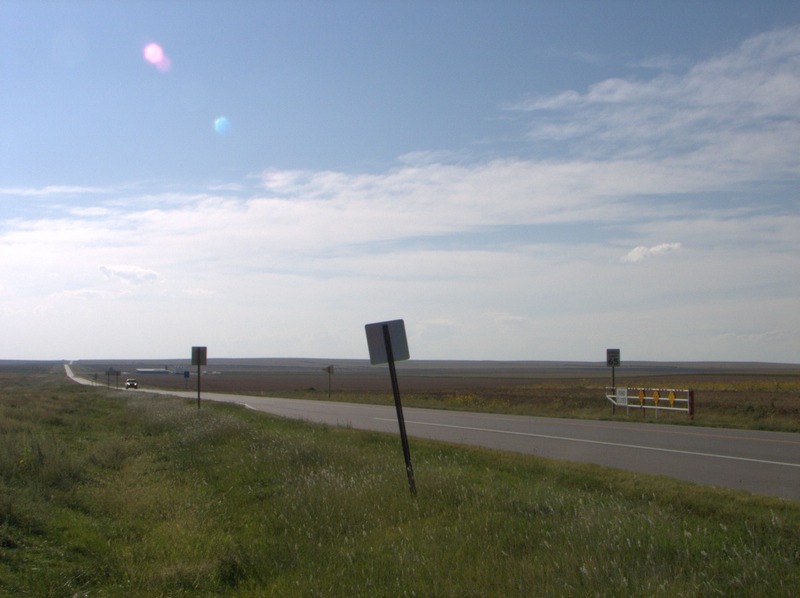 "Santa Fe Trail". 17 Sep. 2016. Lacus Veris. 24 Apr. 2019 <http://lacusveris.com/SFT/en/photos.shtml>. Last modified 27 Apr. 2017. Served 1927 times between 17 Sep. 2016 and 23 Apr. 2019. Contact mailto:CRhode@LacusVeris.com?subject=Santa+Fe+Trail.